We investigate the potential benefits of actuated devices for the desktop workstation which remains the most used environment for daily office works. A formative study reveals that the desktop workstation is not a fixed environment because users manually change the position and the orientation of their devices. 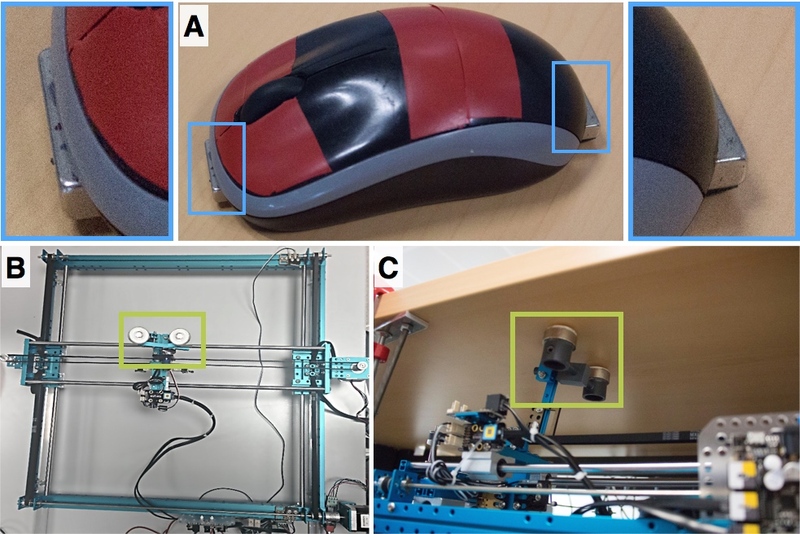 Based on these findings, we present the LivingDesktop, an augmented desktop workstation with devices (mouse, keyboard, monitor) capable of moving au- tonomously. We describe interaction techniques and applica- tions illustrating how actuated desktop workstations can improve ergonomics, foster collaboration, leverage context and reinforce physicality. Finally, the findings of a scenario evaluation are (1) the perceived usefulness of ergonomics and collaboration applications; (2) how the LivingDesktop inspired our participants to elaborate novel accessibility and social applications; (3) the location and user practices should be con- sidered when designed actuated desktop devices. (A) Mouse augmented with two magnets. (B) A plotter under the desk control the the position of the mouse. (C0 An arm with two magnets to couple (or not) the mosue to the plotter. Top: The image is segmented by depth and color to track objects. Bottom: â€�pointingâ€� gesture before and after depth segmentation. The seven features of the LivingDesktop for the proposed applications. 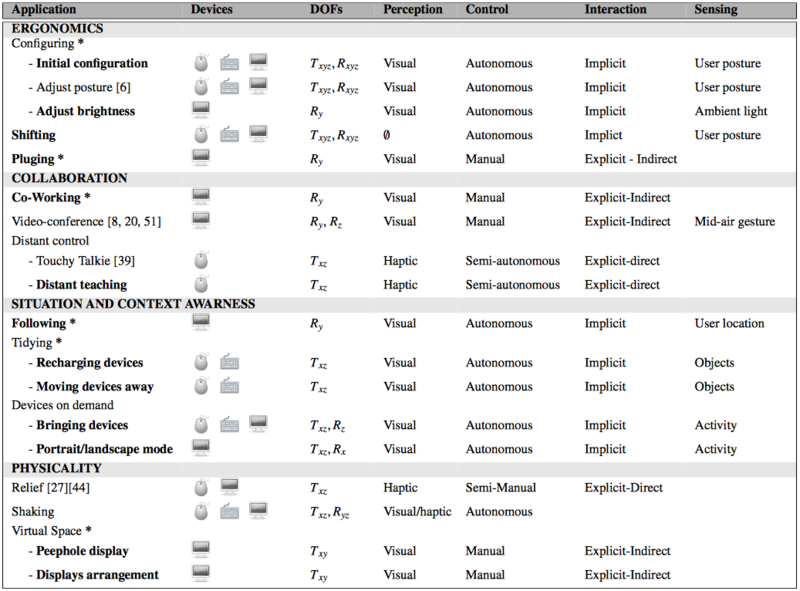 (1) Applications inspired from the formative study are marked with *; Novel applications are in bold; (2) Device; (3) Degrees of freedom (DOFs); (4) modality related to levels of perception; (5) Degree of control; (6) Interaction; (7) Sensing context. The user rotates the monitor to share screen content with his co-worker by using a dedicated key on the keyboard and moving the mouse. The user presses a dedicated key and points towards an object to make sure that this object is inside the field of view of the webcam and visible from the remote user. The monitor follows the user to be readable when working on her companion standing table. The LivingDesktop anticipates when the user wants to put an object on the desk and make room for it. The monitor acts as a peephole display over the virtual space. 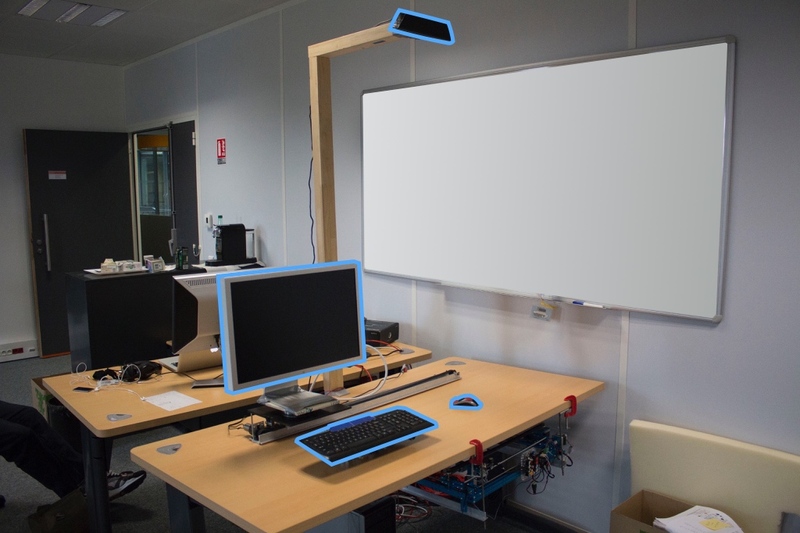 The relative position of the secondary monitor fits the virtual spatial configuration. A summary of participants responses to the 7-point Likert scale questions with the median indicated.